David Lindsay, Jr. is a writer, blogger, accountant, dance caller and folk music performer living in Hamden, Connecticut. He conceived of The Tây Sơn Rebellion after studying American-East Asian Relations at Yale where he earned a BA degree in history in the spring of 1976, with a thesis titled The Cold War and The American War in Vietnam. He graduated a year after the American War in Vietnam ended. You can learn more about The Tây Sơn Rebellion and view David’s journal of his three weeks in Vietnam in 2010 — about visiting many of the sites in the book — by visiting his blog On Vietnam, located at this website: category, Travel in Vietnam, Trip to Vietnam #1 week 1. He also blogs at InconvenientNewsWorldwide.Wordpress.com, focused on World Affairs: Politics, the Environment (Climate Change and Population Growth), the Drug Wars, and the Arts, and InconvenientNews.Wordpress.com covering the same issues in the United States. 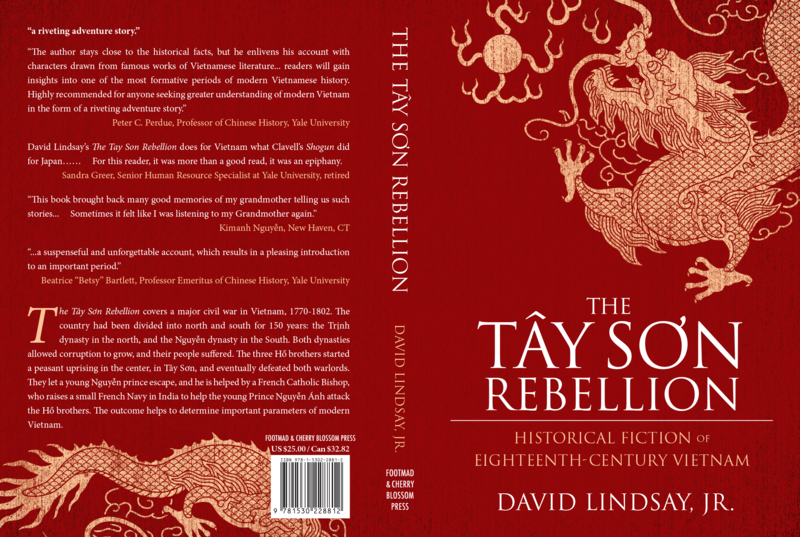 This book, The Tây Sơn Rebellion, has a story of its own. David first drafted it writing part time over ten years between 1978 and 1988. Failing to find a publisher, the author went off to business school, where he earned an MBA from the University of Washington in 1991. He also got married, had three children, and worked in IT, and bookkeeping and accounting with private companies and non-profits for the next nineteen years. In 2010, a tennis ball hit him on the head, and he went back to working on this book. Before business school, David studied Uechi-ryu (Okinawan) Karate for over twelve years, earning his Nidan, or second degree black belt. He studied (Japanese) Aikido for over ten years, stopping at Ik-kyu, right before testing for Shodan, or first degree black belt. David enjoyed and studied folk music and dance at Pinewoods Camp, run by the Country Dance and Song Society. Early teachers included May Gadd, Genevieve “Jenny” Shimer, Arthur Cornelius, Eric Leber and John Langstaff. David started calling contras, squares, and English Country dances in New Haven in 1976. With the Fiddleheads dance band, he started a dance series which became the New Haven Country Dancers. In 1977 he founded the New Haven Morris and Sword Team. He co-founded Take Joy: A Celebration of the Winter Solstice, featuring morris and sword, and also performed with the morris team in a similar show in Stratford CT called Yulefest directed by Henry Chapin. Following Chapin, David wrote and directed four of their productions. When he took his two sons to meet with the YMCA Indian Guides, he was known as David Dances with Bells On.